LaLiga football card ESL lesson ideas. Stuck trying to engage primary school aged children in the ESL classroom? The other day, I was watching a three year old literally squirming with delight in front of me, he could hardly contain his excitement that he had sneaked a football card into class… and was trying his hardest not to be caught as he took it out of his pocket every thirty seconds or so. Bright glossy eyed, he was paying absolutely no attention to me, and was learning nothing…. Take the typical topic toys or sports for example, and you get stuck in the usual route of ‘I play with a ball/I like my toy train etc’ maybe the more adventurous students throw in a ‘My brother plays football.’. Quite simply I find this boring, as I’m sure the kids do too. HOW DO WE ENGAGE YOUNG LEARNERS? What do kids actually like these days? If you ask parents, they will roll their eyes as the recount the endless hours kids spend watching YouTubers – we have tutorials, screen recordings of games they are not allowed to play, unboxing etc… Ask any teacher, and they will reveal their exasperation at the playground pandemic of football cards, pokemon cards, and small plastic characters – anything that can be collected, swapped and treasured. 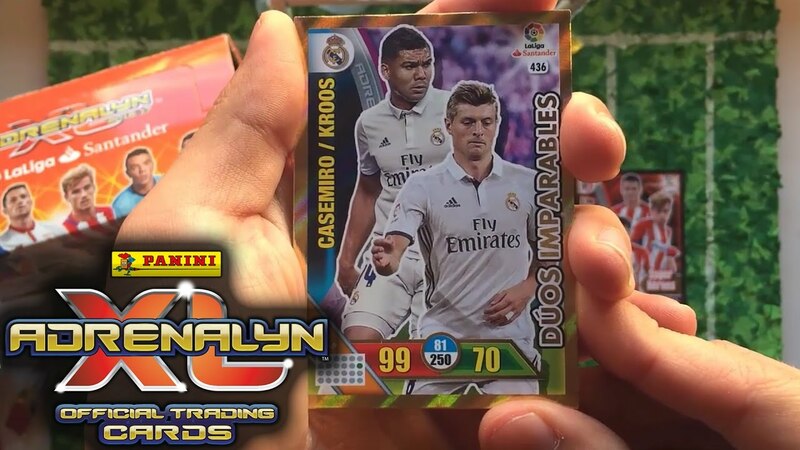 With my absolute zero knowledge of football/soccer knowledge I made a video of my kids unboxing (opening) two packs of ADRENALYN XL 2016-17 LIGA SANTANDER Spanish division football cards, in English. The idea was that teachers could try to engage with their students, on their level, watching the video with them and using it as a springboard into genuine conversation. Here are some ideas you could use in a class based around this video- pick and choose to have an easy ESL lesson plan sorted. Watch some hilarious football fails. private life – where does he live, married? children? With a large class, split them up into groups and ask them to prepare a presentation for the class with the information above. There is an app Adrenalyn XL where you can form teams, activating your cards and play matches. The app is in English. Talk about international players, how do they communicate? Hint – probably in English! Ask them about their collections, if they collect other cards (pokemon etc). Well I hope you find the video a useful alternative to a typical ESL lesson plan on sports. Enjoy and please talk about your experiences in the comments section below. Previo Flashcards and fun in the ESL classroom!